You can’t beat sweet-treats for a branded giveaway, and the Sweetie Cube is no exception. A quirky invention for maximising your marketing, these Sweetie Cubes appeal to kids & adults alike. 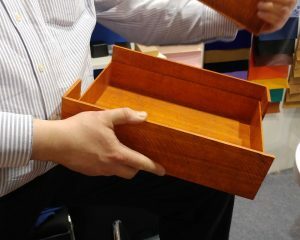 The box relaxes to become like a tray when the lid is taken off, with all over space for branding. Boxes supplied made up and sweet wrappers can be brand-matched. 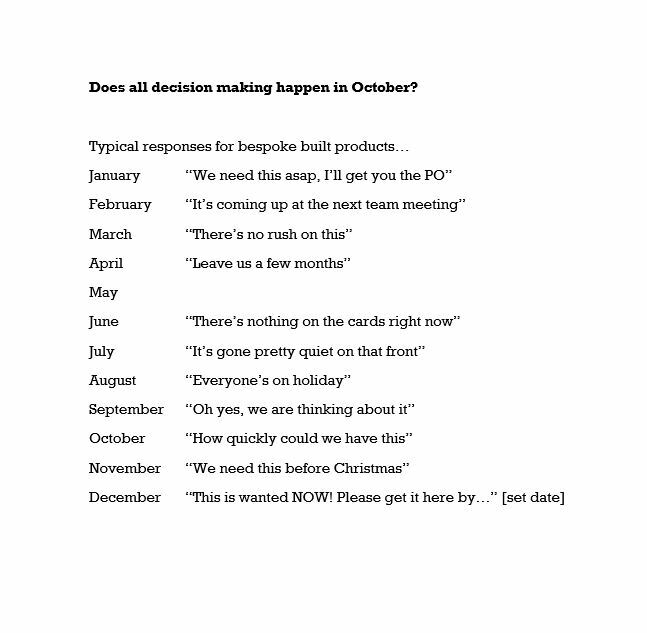 Tick off a redesign on packaging early in the year. Well maybe not a complete redesign, but we’re happy to help with your packaging problems, however big or small they seem. You can phone us on 020 3011 0211 (if you’d like help right this minute – a little like dialling 999), or simply set up a time that suits you. Even the elves are having a holiday! Check below opening hours for the next two weeks. 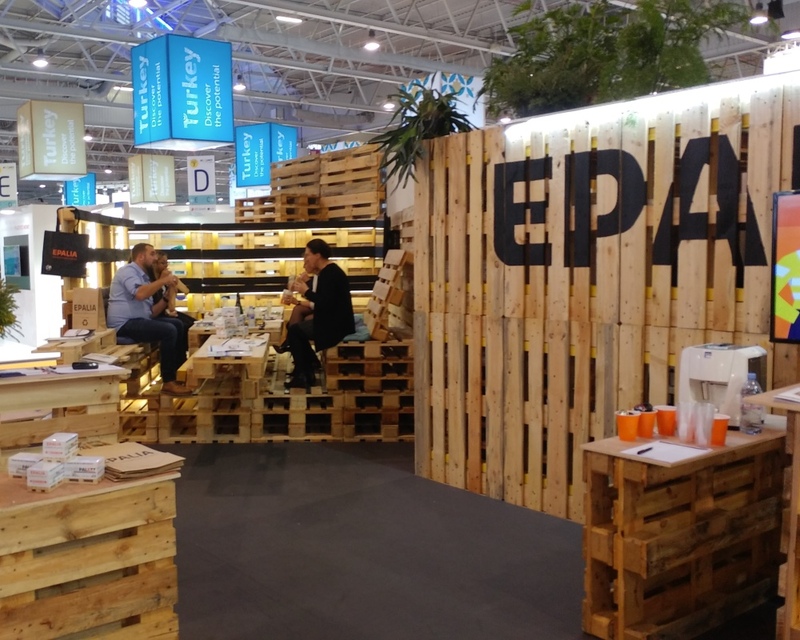 Ronnie & Elspeth visited All4pack Paris exhibition last month, and found a bunch of new creations for our clients. We hope you enjoy them too. 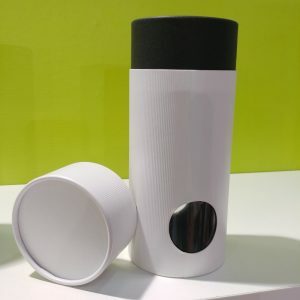 A new round box packaging from as few as 1000, available in a range of sizes, colours and branding. Option to include clear windows and castellated tops. Perfect retail packaging for gifts, candles, and other items. A Kraft brown disposable rucksack – you could call it a solution looking for a problem! With MOQs in the region of 3000, and produced from part recycled material this could make heads turn at a University or student event. If you know of any brown paper backpackers send them this way! – Not suitable for liquids! A stand made entirely from pallets, with a table and chairs built in! Paper over board has been superseded by paper over MDF. 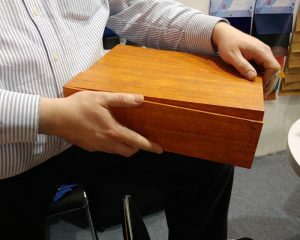 This makes a very rigid box with more weight and very smooth corners. Unfortunately these are not produced yet in the UK so lead time will be extended for development and production, but this creates a box that feels like a piece of furniture. They can be made to size and branded as required. MOQ 1000 pieces. 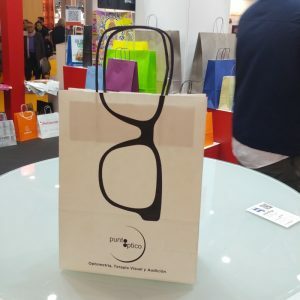 Whoever thought of incorporating the bag handles into the design for this upmarket Optician? Very creative on the High street, to make shoppers look twice. Take pictures of the stands that you found interesting. Then on return to the office, store the pictures, and when you want to go back to the suppliers, just run through the files, and it all comes back to mind. Then simply Google the Company details. 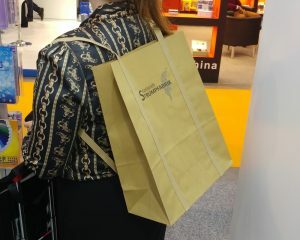 So if you’re wondering what to do with that bag of brochures under your desk from the last exhibition – recycle them! 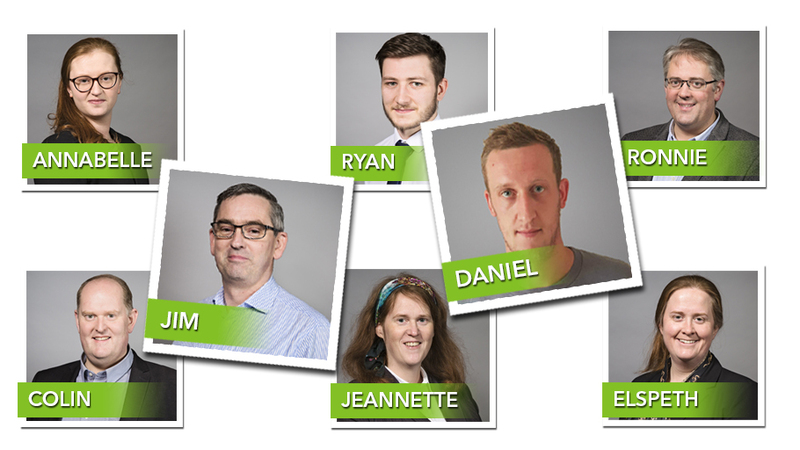 Jim Nash joined us in February on Sales, and Daniel Halms joined us in July running Warehouse Operations. Both have been invaluable team players. Jim has been round visiting a number of new and existing clients and Daniel has cleaned up our warehouse – now it shines (quite literally!). If you’re currently despatching products not only do you want the actual product to look great, but you also want it to arrive looking great. 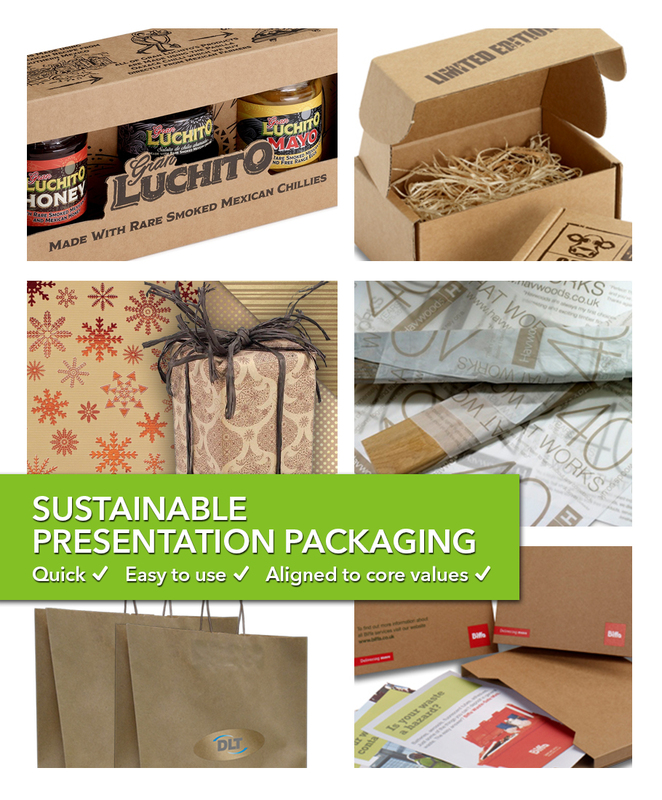 Transit packaging needs to protect your product and promote your brand. 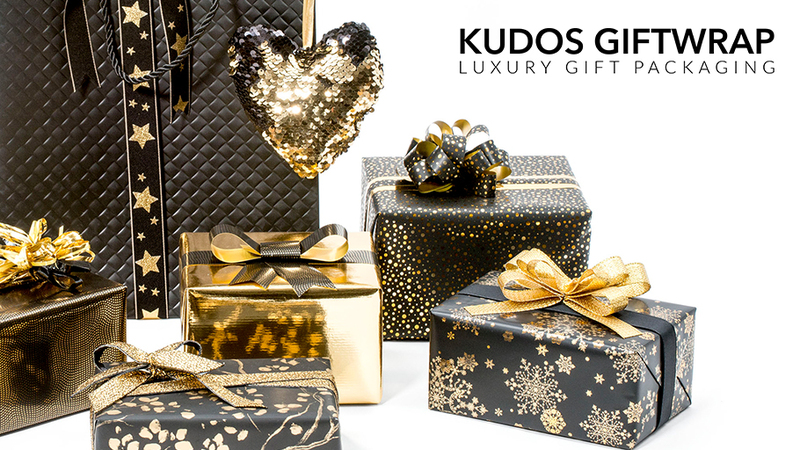 Consider first how you would like your recipient to feel? Expectations vary depending on what the product is, and where it is received (B2B or B2C). Think about what else your customer will be receiving in their day to day, alongside of your products and consider: How will you wow? Is the packaging recyclable – the big R is becoming more and more important – Is the packaging actually compostable? Then what will you use to take up any excess space inside, that will protect goods in transit. Can this be recycled? As our image suggests, tissue paper is one option. It’s unlikely that tissue paper alone will protect goods, but it’s good for brand building, and recyclable. 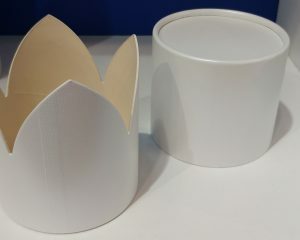 There are other paper based box filler options, and for companies sending out large quantities of the same size product, then a smaller, more fitting box, can save the need of using extra packaging to protect goods. 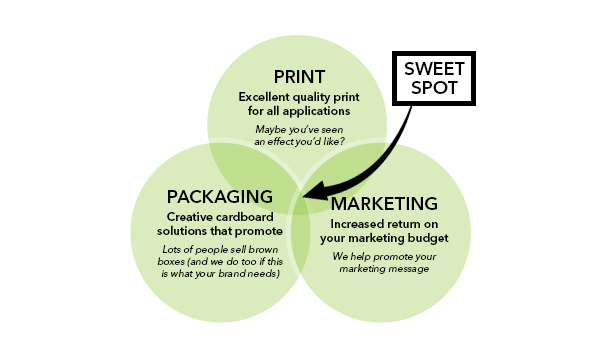 Printed packaging – Yes or No? Do you want it to stand out during Transit – by adding a repeating logo or slogan, or with a design that means it will be recognisable along the way – there’s pros and cons to weigh up: Consider the likelihood of it being tampered with vs. Customers recognising it a glance, and finding your goods in a busy warehouse (different in a B2C situation). Remember branding inside the box, adds to the unboxing experience, particularly the use of colour, for extra wow. How will you close your transit packaging? If it’s tape you’re using, this could be bespoke. What about branded labels? This has to be a cost effective option, especially for start-ups. A peel and re-seal strip? This is making it very easy for customers to make returns, particularly in the B2C environment. Alot of what we recognise is brown boxes, and grey plastic post bags. 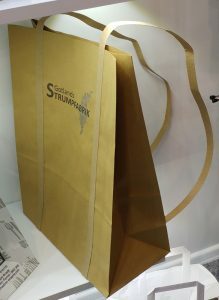 Breaking with the trend, MORI – the organically and ethically produced baby clothes company – ship in leading edge Brown Paper bags (bespoke of course), and they actively encourage recycling. Protectively delivering goods – conscientiously onbrand. 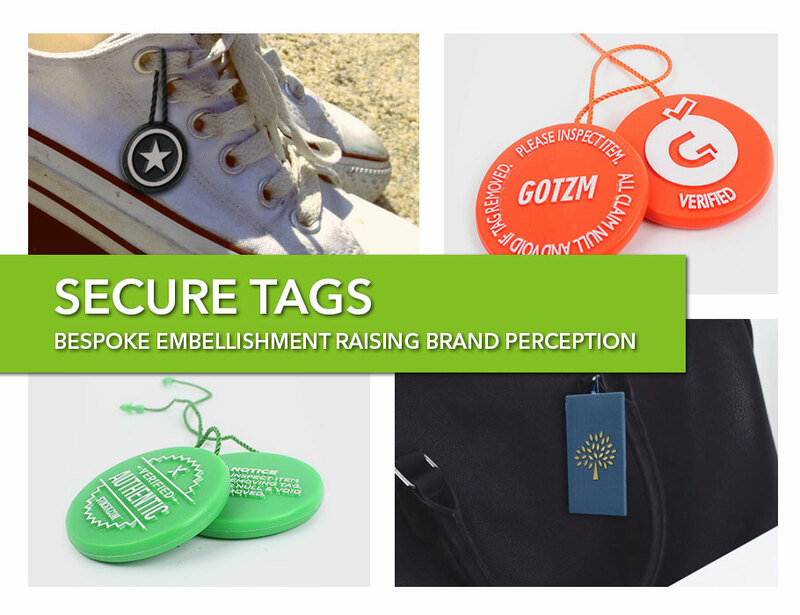 A product sold with your brand on the tag will ensure its authenticity. The more consistent the brand and the more times that the consumer sees it, the more likely they are to recognise it again. Products have the stamp of genuine care as customers purchase a garment or product with the tag still securely in place. The tag stays in place until it reaches the consumer, if not returns are null & void. Build your branded tag in your own Pantone colour. The perception is that if you’ve tagged a product it’s worth more. Using your brand voice, “Hi fans” or “Hello friends”, there’s space here to add some text that will build up the message you send to a growing client base. If your warehouse and processes have been quality assessed, this is a way of spreading the word, and increasing the return on investment on the Quality standard. This has to do with the colour and design of the tag, to help your product stick out. If your competition do not have a Secure tag, here’s your ultimate leg-up! Grab the idea quick and give your brand the edgy extra. And if you can think of an 11th reason, or want a quote, feel free to contact us! As you will be aware, a new privacy law comes into effect on Friday 25th May, in the form of The General Data Protection Regulation (GDPR) (EU) 2016/679. These new laws are a huge positive step in controlling the use of personal data, and here at BoxcoUK we are committed to ensuring the ongoing protection of the data you provide us with. To request a copy of our new policy please send us a message from our Contact us page. We would like to reassure you that BoxcoUK have not, and will not, ever sell or use your data in an unauthorised way. Added to this we don’t want to annoy you by emailing to check it’s ok to email. As part of our mailing list you will occasionally (approx. once a month) receive information on new and exciting marketing ideas, and all-important company and industry news. We can’t promise that every email will be relevant to your department, because we work with a diverse range of clients across Marketing, HR and other Management teams, so the relevance of our marketing ideas will vary massively across the audience we serve. What we definitely haven’t changed is our ability to listen to you, so if for any reason you’d like to clarify your privacy with us; or you need some advice on your next Marketing Campaign, Welcome Pack, new Product packaging ideas etc. then please contact us on 020 3011 0211.